I recently purchased a 24-port Gigabit Layer 2 Switch that supports VLAN tagging and trunking. Dell PowerConnect 5324, see here, has 24 Ethernet ports and is capable of tagging and untagging Frames at wire speed. It is a discontinued model, however doing some googling I found a updated firmware and IOS image! The topology is pretty typical of “routing-on-a-stick” for Multiple VLANs. I have a Linux server running Ubuntu 12.04 with a single NIC and the Dell PowerConnect switch. 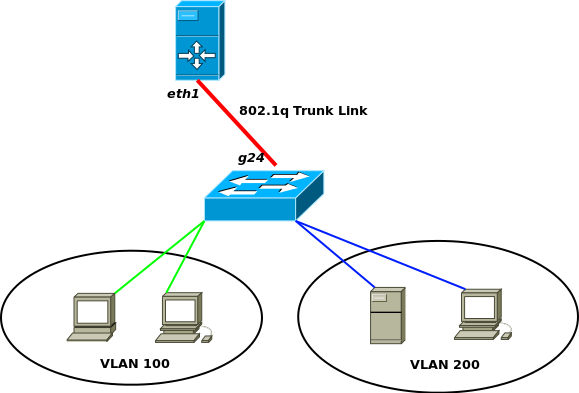 Now before we continue with the configurations, I want to explain the differences between an Access Port and a Trunk Port when using VLANs. An access port is 99% of the time connected to an end user device, such as a computer, Wireless AP, etc. A trunk port, is connected between network devices and carries multiple VLAN tagged Frames. A trunk link is what makes this setup possible, carrying VLAN 100 & 200 Frames over one physical cable from the Linux Router to the Dell Switch. There is also the terminology of Tagging and Untagging. 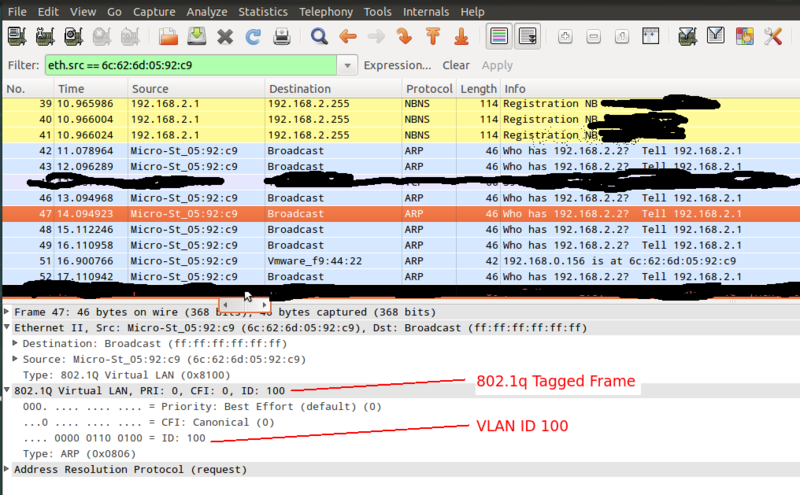 Tagging referes to the 802.1q (or Cisco’s ISL) Ethernet tagging of Frames as they enter a Access Port. Untagged is the opposite, this refers process to untagg Frames as they leave an Access Port. The tagging and untagging is VLAN ID specific, meaning you can’t tag a Frame with VLAN ID 100 and have VLAN ID 200 untag it. Also, Tagged Frames cannot be sent to end user devices, as the end user device will not know how to read the Frame. For our example, g1-g16, and g17-g23 are Access ports. Maintain these VLAN ID and Interface Port associations happens on the Switch itself, why Managed Switches are able to support VLANs and unmanaged Switches do not. When you run this command you are denoting a physical interface as an Access Port for VLAN 100, Frames leaving this interface will be Untagged from VLAN ID 100, and anything entering the interface tagged on VLAN ID 100. For more information on VLAN tagging see here. NOTICE: The switch will spit back the current VLANs it knows about from it’s VLAN database. Therefore, if you add more VLANs to the database you will need to reissue this command to add the new VLANs to be allowed across the Trunk Link. # at boot time, one per line. Lines beginning with "# are ignored. NOTICE: The terminal will echo a information message telling you that eth1.100 and eth1.200 have been added. Run ifconfig and you’ll see them. That’s It! The Linux Router is able to communicate with the Dell switch via an 802.1q Trunk Link. To test the VLANs are working and separating the Traffic based on the Access Ports, grab a Laptop and a Network cable. Configure your laptops local NIC to 192.168.1.5/24. plug the cable into your laptop and any one of the g1-g16 ports. Try to ping another device on that network, such as 192.168.1 or .2. It works! Now lets test to make sure the VLANs are separating traffic, using the same ip of 192.168.1.5/24 connect your laptop to any one fo the g17-g23 ports. Remember these ports are on a different LAN whos layer 3 network is 192.168.2.0/24(this really doesn’t matter because we are dealing with Layer 2 only). Try to ping a device on the 192.168.1.0/24 network. Hmm, doesn’t work….That’s a Good thing! The reason is the VLAN separation going on in the switch. When you tried to ping 192.168.1.1 from 192.168.1.5(laptop) an Layer 2 broadcast went out to all ports VLAN, in this case VLAN 200. The broadcast did not cross into VLAN 100 because of the logical separation. A lot more is going on here, but is outside the scope of this article to be explained. DId you do some speed test? cpu consumption? I want to switch 6 vlan with L2 Switches. I did with a Fortigate unit but transfer eat about 52 % of the firewall. Unfortunetly I lab’d out this post two years ago and do no longer have any stats. It was a POC test so only a handful of devices. If you do go along with testing out your 6 VLANs let me know! Dell PowerConnect 5324 Setup Tasks on What is NAT-Traversal? ?